While fishing this beautiful river, you will pursue Rainbow Trout, Brown Trout, and Cutthroat Trout. We are located in the west central part of Wyoming, in the beautiful town of Thermopolis. With the Owl Creek Mountains to the West, the Absaroka Mountains to the North, and the Bighorn Mountains to the East, Thermopolis offers a unique beauty as it lies nestled in the valley at the base of these majestic mountain ranges. With the red shale rock, the gentle rolling grass covered hills, abundant wildlife, and the towering mountain peaks as the backdrop, the scenery you will see as you drift down the Big Horn River is as spectacular as the fishing itself. The Big Horn River starts its northerly flow in the Wind River Mountains, some 200 miles southwest of Thermopolis, under a different identity, the Wind River. The Wind River becomes a tailwater after being released from Boysen Dam some 13 miles south of Thermopolis. The name changes to the Bighorn River upon exiting Wind River Canyon, at the sacred "Wedding Of The Waters". The Bighorn River continues north into Montana, flowing into the Yellowstone River, then into the Missouri River, ultimately ending up in the Pacific Ocean. 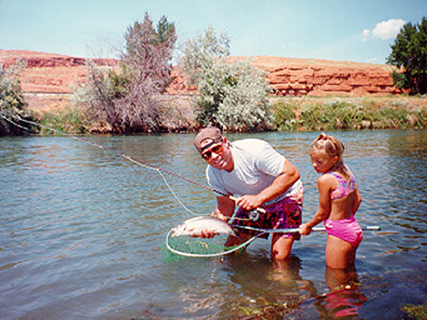 It's on this tremendous river, Reggie Treese owner & operator of Bighorn River Outfitters has dedicated his time to providing you with a guided fishing trip adventure of a lifetime. 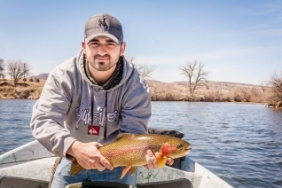 Reggie was born and raised in Wyoming and after fishing the Big Horn River in and around Thermopolis for over 40 years he has chosen to offer his guided fishing services to share with you the excitement of fishing for wild trout. 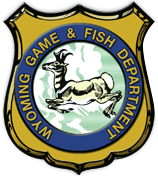 Reggie began operations in 1993 and the wealth of knowledge obtained over the years, will be shared with you, in the pursuit of trophy trout. While fishing this beautiful river, you will pursue rainbow, brown, and cutthroat trout. From the time they hatch and reach 16 inches long these fish grow at a rate of 3 inches per month, which proves to be one of the fastest growth rates in the country for fish in a free flowing stream. The average fish weight is 3 to 4 pounds with lengths of 18 to 19 inches, with some rainbows and browns reaching over 10 pounds with lengths of over 30 inches. We have caught and released cutthroat trout weighing over 6 pounds with lengths of 25 inches. 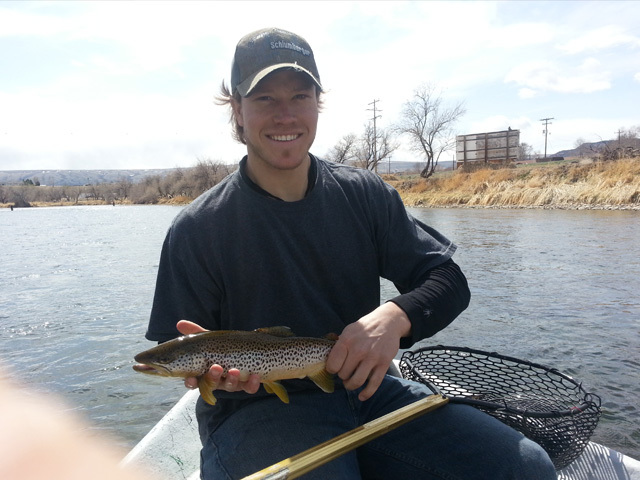 Come join us for a Bighorn River fly fishing trip that you'll tell all your friends & family about! Bighorn River Outfitters can be best reached at 307-272-3474 to Book your next Bighorn River Guided Fly Fishing Excursion.